Play dough is so great for kids of every age. 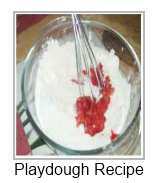 It can be made at home much more cheaply than purchasing it, plus you can be so creative with play dough recipes even adding coloring and herbs. 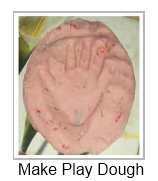 Play dough can be made without cooking. Older kids can make their own with supervision. I think it has mostly taken me no more than ten minutes to make and color so that the kids can dive in and create. You can make a big batch if you like as it will last well in a sealed container in the fridge. Science: mixing ingredients and watching as they change state and the differences as more water, flour, food coloring and textures are added. Exploring which tools are best for cutting, snipping, rolling, and shaping etc. Sensory exploration: the differing smells and textures of the dough make for great learning opportunities. Literacy: talking about the feel, shape, color of dough, the child listening as you give instructions such as “cut the dough into two pieces” and then responding. Making letters from the dough, creating names from the dough etc. Kids can be really creative, they can make cup cakes, make models, do pretend baking, they can add materials to it .